PHILADELPHIA (FinalCall.com) - National Geographic magazine insulted the historical and cultural legacy of Blacks during Black History Month by distorting history and blatantly insinuating that ancient Egyptians were anything but Black, said a critic. “If you assume that this article is about the Black pharaohs then the question that is begged is, who were the other pharaohs?” Dr. Asante asserted. According to the author of “The History of Africa,” a comprehensive history of the continent, National Geographic writer Robert Draper erroneously suggests the pharaohs were not Black and it didn’t matter since “the ancient world was devoid of racism. At the time of Piye’s (the Nubian monarch who reunified Ancient Egypt) historic conquest of Egypt, the fact that his skin was dark was irrelevant,” he argued. Referring to Septimus Severus, a Black Emperor of Rome, Mr. Asante said, it would have been better to write an article called “The Black Emperors of Rome.” “That would have made sense since most of them are White. But to say ‘The Black Pharaohs of Egypt’ where most of them were Black.. that doesn’t make sense,” he said. “I disagree with the article’s intent because the intent is to throw African people a bone. This article came as the result of the tremendous attempt on the part of Europeans to claim Egypt as not African. That was the attempt of the King Tutankhamen’s exhibit when it was first presented. So this is a long struggle.” National Geographic has a history, going back at least to the 1940s, of portraying the ancient Egyptians as anything other than Black. The June 2005 edition featured a Caucasian-looking King Tut on the cover. The same image was used on a King Tut exhibit that recently toured the country and featured on the cover of the February 2008 edition. Seemingly anticipating some backlash, the online edition of National Geographic provides a video of Dr. Zawi Hawas, head of the Supreme Council for Egyptian Antiquities, who said the race and the origin of the ancient Egyptians are difficult to ascertain. He attempted to explain away the Black statues. “If you look at the statues that were colored black, it doesn’t mean anything. Sometimes black can show the fertility of the land,” said Dr. Hawas. Another video provided is of Shomarka Omar Keita, a Black geneticist who postulates that modern Egyptians look similar to ancient Egyptians, i.e., light skinned Arabs or non-Black. 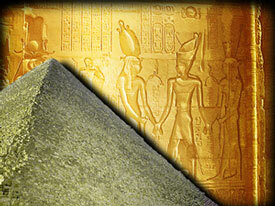 “The idea that the Ancient Egyptians are like the current Egyptians is so far off that it is laughable. General Amr ibn al As was invited by the Black people of Egypt of the 7th century to come over to help throw out the Romans, when this was so he remained. This was the beginning of the large Arab presence in Egypt, 639 (B.C.) was the major movement of Arabs to Egypt. They found the Black people already there. “The presence of Arabs today in Egypt should not be read as an ancient presence just as a White presence in Australia should not be read as an ancient presence. The same for America. We have to take back the writing of our own history for it is absolutely essential,” Dr. Asante said. He pointed to ancient firsthand testimony from the 5th century Greek historian Herodotus who referred to the ancient Egyptians as “melanchroes” (Black-skinned). Dr. Asante argued if the ancient Egyptians were White, Herodotus would have used the term “leucochroes” and if brown or red skinned “phrenychroes” would have been used. Professor Asante debunks the notion that ancient Egyptians did not refer to themselves as Black as European Egyptologists suggest. The meaning of Egypt or Kemet is “Black nation,” “Black country,” “the Black City,” “Black land,” or “Land of the Black People,” Dr. Asante said.